While searching for information about the Constellation Cygnus, I came across the mneme MEW3 and the Sator Square. I’ll admit, I’d never heard of these. I made a Sator Square, left it on my computer, and had a look at it every so often, trying to figure out what it was all about. Most of the translations seemed to suggest something about farmers ploughing, but I thought that rather odd. Why would ayone create a palindrome about farmers ploughing? Then I found the following, which seemed more logical. From the Creator flows the understanding of the workings of the spheres. But the Sator Square doesn’t quite end there. No, for some reason I’m not sure of, I had to add ‘star light, star bright’ to the picture. I think my original idea had to do with squaring the circle, and I wondered could I add a pentagram, and would it suite. But that didn’t work, so I ended up with the black configuration. I was very curious to see if the lines created any meaningful words. They do. By only using letters through which the lines run, I came up with: tereo, opera, aeset. Start at the top point of the ‘head’, move down the left leg, and up to the right arm. Then straight across the shoulder. Then move down the right leg, and back up to the top point of the head. Well…………it turns out these are words from three different languages; Greek, Latin and Spanish. Tereo is Greek, and from the New Testament Greek Lexicon, the definition is: to attend to carefully, to guard………..metaphor, to keep, one in the state in which he is to observe………………..to reserve: to undergo something. Aeset, is Spanish for, asset. Although it isn’t likely that modern Spanish as a language existed on the Iberian Peninsula in 79 AD, none the less, the Spanish word, aeset, does mean asset in English. This word is neither Greek nor Latin. The Latin term was, ab assit. It comes to the English language through old French and Latin. However, the oldest ancestors of modern Spanish were Common Latin, Celtiberian and Basque. By 79 AD, the Romans had been in Spain for more than two hundred years, and obviously this word existed in 79 AD. From the Creator flows the understanding of the workings of the spheres. Attending carefully to the workings (of the spheres) is an asset (to understanding). After a few hours though, I realized that there was a fourth language used. That fourth language turned out to be Ogham, and this was a really big surprise, but the message makes perfect sense. My very first clue came from the four Ts. When they are joined together it creates a square with its corners turned to the cardinal points. This is Oir, the Spindle tree, it has an alternative name, Tharan, but it is the lightning which is referred to. This tree symbol is connected to enlightenment. Just as a flash of lightning can light up the sky for a moment, enlightenment can also come in a flash. I refer to this symbol as the Square of Enlightenment. I have found this device several times, in rather strange places, and it was always ‘enlightening’. On the other hand, T is also Tinne, the Holly, which is said to be best in the fight both spiritual and physical. It speaks of balance and equilibrium because spear shafts were made from Holly. So perhaps this person is throwing a spear of enlightenment, with balance and equilibrium. “The pen is mightier than the sword”, perhaps. So after this find, I decided to make more squares using only the letters at the corners of each square to get the meaning. The red square says SRSR. S is Saille, the Willow, this has to do with the Sun and Moon combining to create the pattern of the year, punctuated by days and nights. It also has to do with eclipses, since these are part of the movements of the Sun and Moon. R is Ruis, the Elder which symbolizes the beginning in the end, and the end in the beginning, and is connected to the Cauldron of Immortality. The Earth was considered a Cauldron of Immortality, since all life comes from Her and returns to Her. We think of immortality as being a personal thing, we’ll live forever. Our ancestors passed on their genes to us, we are their immortality, just as our descendents will become our immortality. Genetic immortality over great spans of time, which we keep track of with a calendar. For me, Cauldron of Immortality equals Earth time and the calendar. Therefore, SRSR, tells us that the movements of the Sun and Moon create the calendar. RPRP, gives us Ruis again, and Phagos, the Beech, which symbolizes old knowledge, old writing. The message being that the calendar is old knowledge, and can be found in old writings. EEEE gives us Eadha four times. This is the White Poplar, whose whispering leaves give us the small still voice of God. But the letter also symbolizes rebirth. Every year is reborn, June 21st will keep coming around again and again. These four Es are also an example of the mneme, MEW3, which is symbolic of the quarters and cross quarters, regardless whether it is the year or the land directions. In this case, when the four Es are connected, it also creates a square of enlightenment. The eight divisions of the year are very old and come from astronomy, our calendar is based on astronomy. Land directions are a very big part of astronomy. If you want to know if it is the longest or shortest day, you would have to know in which section of the horizon the Sun will rise and set. To be able to predict eclipses, you would have to understand the movements of the Sun and Moon in relation to each other, and know the direction to watch to be able to do this. The four Es are telling us that we must observe the eight quarters and cross quarters of the horizon, so we will understand the eight divisions of the year, and be able to predict eclipses. In the centre we have N which is Nuin, the Ash, the World Ash or Cosmic Ash, that which links together the microcosm and the macrocosm. The microcosm being the Earth, and the macrocosm being everything else around our planet. It’s certainly in the right place. Because a circle can be created anywhere on Earth, the World Ash, can exist anywhere on Earth. I can create my own private calendar circle in my own back yard, and so can anyone on Earth, if we have the right sort of horizon available. The circle is our own World Ash. But the circle will not just give you the means to create a calendar, it will also give you land directions once you have sorted out the movements of the Sun and Moon. Next we have AOAO or OAOA, depending on which square you look at. A is Ailim, the Silver Fir, however the name actually means Elm, but Silver Fir and Elm are very tall and symbolize high views and long sight. O is Oir which is enlightenment. I have seen Oir used as O in another document, where it was also represented as a square of enlightenment. So high views and long sight gives you enlightenment. On the other hand, enlightenment gives you high views and long sight. Usually O is Ohn, the Furze, which represent collecting together the elements needed to attain an end. So high views and long sight will give you the ability to collect the information you need. On the other hand, collecting together the information you need will give high views and long sight. The long sight being the ability to know what is to come and when, whether eclipses, or the eight divisions of the year when Celts celebrated their major festivals. Very Celtic, that duality. It shows up in their art a great deal. The four Ts alert us to the fact that this Sator Square is a square of enlightenment, and he or she is throwing it at us like a spear. We need to be in one spot with high views and long sight, where we can watch 360 degrees of the horizon, to gain knowledge about the quarters and cross quarters of the year. This will give us knowledge about the movements of the Sun and Moon, which will give us the ability to predict the coming festival days and eclipses, and that this is a continues cycle which will go on for ever and ever. Once this information is gathered, we will have gained knowledge about the movements of the Sun and Moon, the eight divisions of the year, eclipses, land directions, and water navigation also. According to this writer, the calendar was old knowledge and could be found in old writings. Which by his or her time, it was old knowledge, and today we know that there are ancient astronomy records. At the moment, the oldest calendar we know about is from Egypt and dates c4236 BCE, however, if all stone circles and henge monuments were for keeping a calendar, then this knowledge is much older, even if we have no records connected to them. The stone circle at Nabta Playa in Egypt, dates c6000-c4000BCE. Adam’s Calendar in southern Africa, may date to at least c25,000 BCE. This might seem surprising, but why not, after all humans have been on Earth for millennia, and at one time there was nothing to watch at night but the Moon and the stars. Hunters and gatherers ranged over large areas of land. The Sun, Moon, stars and landscape became their map. Many people today never take any note of the movements of the Sun, Moon, planets, and stars. We no longer depend on them to hold our festivals, nor do we need them to travel around by. Many people living in cities all their lives, have never seen a sky full of stars. I’ve witnessed someone over seventy years of age discover this for the first time. She was quite in awe, and thought it so unusual that nothing would do but I had to go outside to see this wonderful vision she had discovered. Have to admit, it was quite fabulous that night, Milky Way and all. Well………..must say………………….I’m really quite stunned by this message contained in the Sator Square. This square has been connected to the Knights Templar, but they came long after this square was created. They may have understood the whole message, or not, but the oldest one of these was found at Pompeii. Because the words are Latin, and the oldest was found at Pompeii, it’s thought to be Roman, and that the Romans spread it all over Europe and England also. But I don’t think the Romans were using Ogham, in fact, they seem to have had little time for the Celts and their Druids. No, whoever created this cunning square understood Latin, Greek, an early form of Spanish, and Ogham, but I have no idea how it became so widely spread. It’s possible that there are numbers involved here also, but the most noticeable one in the Ogham configurations is four. That number four, which as far as I’m concerned has to do with hidden secrets. Well hidden here. There were four languages used, that was also hidden. And ‘star light, star bright’? well I know where that comes from, and I will write about it another time, but it also gives number five. There are five rows of five letters each, giving a total of twenty five. There are five divisions of five letters each in the Ogham tract, for a total of twenty five. Tereo opera aeset gives fifteen letters. That’s how many letters were said to have been in the earliest tract. These were the consonants. The next group to be added were the vowels, the last group the diphthongs. I can find all the diphthongs on this square. In diagram e, we have a red cross or X, this is the Grove or Sacred place. All knowledge can be found within the Grove. All the tree and plant symbols of the Ogham tract contain their own knowledge. The Grove contains all of them. Since this covers the whole square and crosses through the Cosmic Ash, this square is the Sacred place, and it contains all the knowledge within the trees which gave us the Ogham message. The two blue parallel lines crossing two parallel lines is Uilleand, the Honeysuckle, and it symbolizes the hidden secret. This configuration usually gives a diamond or lozenge in the middle, but we’re working with a square. The hidden secret it reveals is the fact that one must observe the sky from one place and be able to see in all four directions, to obtain good results which will give you an accurate calendar. This being the four Es and the N within the square. In diagram f, we see a representation of Phagos, Beech, the Hook, old knowledge, old writing. Our English word, book, comes from an old form of the name, Beech. At one time thin slabs of Beech were used to write on. Several of these were attached together, creating a ‘book’. When you join the four Ts or the four Es, you get the square of enlightenment, which is Oir or Tharan. If you join all the letters vertically and horizontally (g), it gives you a net, four squares by four squares. This is one quarter of a square of Hermes. There are various forms to the net in different Ogham tracts, some have two by two, others three by three and some four by four. My tract has three by three because this is what Colin Murray had in his tract. In Mesopotamia, this version was known as Bab-Ilu, the Gate of God. If all the outside letters are joined through N, you get a sixteen point windstar. A flower with sixteen petals is said to have been the device of the Ancient Mystery Schools. Astronomy, mathematics and surveying were some of the mysteries taught. There is still a debate about the age of the Ogham tract. Some scholars believe that it was created by the Gnostic missionaries in Ireland. The Forfeda, which are the last five letters in the tract, represent diphthongs which were supposed to have been missing in the Irish Gaelic. However, the oldest Sator Square was found at Pompeii, and is dated 79AD because that’s when Pompeii was buried under volcanic ash. I have found an example which dates to at least the Bronze Age, and the Forfeda came into existence c3200 BCE. I will write about that another time also, but ‘star light, star bright’ comes from the same place. But for the moment, the Sator Square proves that the whole tract was intact by at least 79AD, consonants, vowels and diphthongs. It also shows that there was a genius at work here, who understood several languages. The whole thing is also typically Celtic, it has layers for those who could understand this message. The first one which says SATOR AREPO TENET OPERA ROTAS, the second which gives us TEREO OPERA AESET, the third which gives the Ogham message. I would put the last five symbols, the Forfeda, in a separate category. They would be the fourth layer which makes them the hidden secret. The Forfeda symbols are all connected to astronomy and surveying. X marks the spot. The square with its corners turned to the cardinal points, we still use those on maps today. The two parallel lines crossed by two parallel lines, usually gives a diamond or lozenge in the centre when seen in the tract. Divide a square or a diamond in two and you have two triangles. Surveying is done by triangulation. The hook represents a star watching/ surveying device. The net which is usually called the Sea, represent lines of latitude and longitude. You would have to understand those to navigate at sea, particularly out on the ocean, where there is no landmass to give you direction. The Forfeda are said to be Manannan’s treasures, but along with them he also had the rolled up strip of the whale’s back, and these were all kept in the Crane Bag along with all the other letters of the tract. The strip of the whale’s back is the line which joins all the letters together. The rolled up strip of the whale’s back is the measuring cord. The sixteen point windstar is a separate device altogether, although this does have to do with astronomy, surveying, map making and sailing, it seems more like a signature or seal. The mark of the Ancient Mystery Schools, which became the fifth layer. Just think, while some of the major religions were trying to curtail the common people’s interest in astronomy, this message was sitting in plain view for all to see all during those long, long years. Astrology has been mixed up with astronomy since very ancient times. This is a type of divination which suggests that the Sun, Moon and planets regulate our lives. Our fate is connected to these orbs and the Houses they appear in. The Sun, Moon and planets were worshiped as gods at one time, but both the Jewish rabbis and the Christian priests, discouraged this running after pagan gods, and tried to steer the common people away from both astronomy and astrology, and put their faith in one God instead. And listen to them. Neither astronomers nor astrologers died out, but definitely had a hard time of it for a long time. More than one person found themselves excommunicated and/or locked up for suggesting something as simple as, the Earth goes around the Sun, even though the Sumerians already knew that the Earth and all the other planets go around the Sun. The idea that the Sun goes around the Earth came from Ptolemy with his geocentric theories of planetary motion, which held that the Earth was the centre of the Universe, with the Sun, Moon and planets revolving around it.This idea lasted for fourteen centuries until the theories of Copernicus were finally adopted. Any connections to the Ancient Mystery Schools were also discouraged, since they were also involved with astronomy, higher mathematics and surveying, and whatever other mysteries they studied. They didn’t die out either, rather they were driven underground, the remnants of which do not reappear among the general population until the seventeen hundreds, but even then under a heavy veil of secrecy, and only accessible to certain people. The Knights Templar may have had a great deal of this knowledge, but they were persecuted into near extinction. 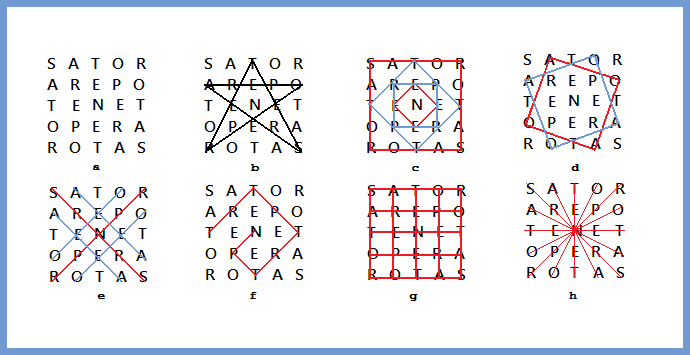 But who was the creator of the Sator Square, and why did they hide it among Latin words? A Druid dragged off to Pompeii as a slave? Or a well educated noble or Druid, leaving their message behind on their travels? Whichever way, it probably tickled their Celtic funny bone. Considering their other artifacts, they seem to have had a very sly sense of humour. Although I have seen the meanings of some of the symbols of the Forfeda switched around, Phagos the hook as the hidden secret being an example, I think Colin Murray had it correct due to other things I have found, where the parallel crossed lines as Uilleand, was symbolic of the hidden secret. It is possible that at one time, the meanings of Phagos, Uilleand and the Net may have been interchanged to keep the secret hidden. Without Colin Murray’s interpretation, I would not have discovered the hidden secrets within other things. All of which were quite enlightening, and very surprising. One of the most amazing things the Sator Square brings to light, is that Ogham, once understood could bypass any language.The person who created this didn’t speak the same language as I do, but symbolic meanings translate into any language, even over almost two thousand years. They didn’t spell out words with it, but used the most basic symbolic meanings of each letter instead. So far, this is not the only example of Ogham being used this way that I have found, and it may be lurking in other ancient pictures and constructions. Coll Hazel’s Ogham, from the Celtic Tree Oracle by Liz and Colin Murray. The Ogham tract and the Sator Squares used here, were created by the author. This entry was posted in Ancient History and tagged Ogham, Sator Square. Hope all is well.I thought I might leave this website here for you!I think you may find a few tidbits that may interesting to you! How ironic, that’s the website where I found the Sator Square and MEW3. It’s been a whole year since you have posted anything? May you travel the figure eight back here! Too bad you have not the bandwidth to see this below! Ancient Knowledge Pt.6/3 – Lost History, Phoenicians, Alphabet, Symbolism!